...... work with HotRod and X-Arcade, SlikStik/IPAC controllers. GameEx has support for playing MAME and other emulator game videos (AVI, MPG, MNG). GameEx also makes a good CarPC frontend. The original goal was for it to be used on Windows XP Media Center and also Arcade Cabinets. GameEx will run on any version of Windows 98SE, ME, 2000, XP and Vista. 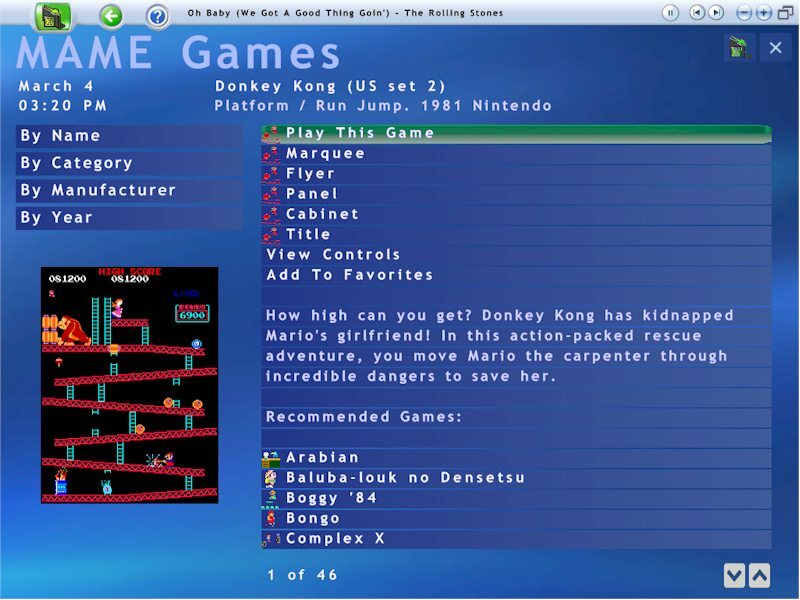 You don't need Windows Media Center to run GameEx. GameEx has support for Ultimarcs J-PAC and ArcadeVGA, LCD\VFD Displays, the MCE remote control, Gamepads, full Mouse control, Widescreen displays, Vertical (rotated) displays, volume control, Music playlists and a fully functional Jukebox including visualisations and support for ogg, mp3, wma, m4a and FLAC. Music can be played and controlled while playing games. Qweas is providing links to GameEx 12.78 as a courtesy, and makes no representations regarding GameEx or any other applications or any information related thereto. Any questions, complaints or claims regarding this application GameEx 12.78 must be directed to the appropriate software vendor. You may click the publisher link of GameEx on the top of this page to get more details about the vendor.